STI’s pocket catalog offers descriptions and full color pictures of their complete Stopper® Line. 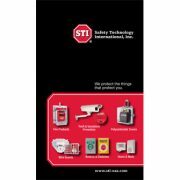 STI manufactures wire cages, push buttons, protective covers and alarms to help prevent theft and vandalism to: fire pull stations, smoke detectors, strobe/horns, biometrics, keypads, AEDs, exit signs, emergency/fluorescent lights, control panels, motion detectors, CCTVs, clocks and bells. Environmentally controlled cabinets, alarms for exit/entry doors or fire extinguishers, an alarm/strobe controller and supervised wireless alerts. STI-9640 — Wire guard protects a wide range of exit signs from vandalism and accidental damage. 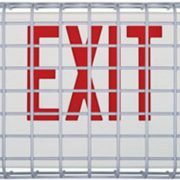 Wherever exit signs are at a risk from either intentional or accidental damage, installation of this tough cover is the solution to the problem. Guard is construction of 9-gauge coated steel wire which makes it extremely difficult to break. It is large enough to cover a wide range of exit signs, yet offers simple removal for light bulb replacement. Guard may reduce projected light values, verify correct exit light requirements when using the guard. Backed by a three year guarantee against breakage in normal use. STI-1100 — Polycarbonate cover has helped stop false fire alarms for over 30 years without restricting legitimate alarms. The protective cover mounts directly to the wall over an existing pull station. 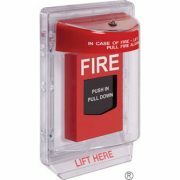 When lifted, a self-contained alarm sounds, drawing attention to the area. Cover helps deter pranksters from triggering false alarms, reduces unnecessary business interruptions or evacuations (which saves precious time and money). Use of the cover also helps insure the local fire department is available for real fire emergencies instead of responding to a false alarm. Three year guarantee against breakage of polycarbonate, one year on electronics. UL/cUL Listed, ADA Compliant. STI-6200 — Sturdy, self-contained alarm helps solve the problems of unauthorized use, theft and vandalism of extinguishers. 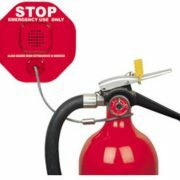 When the protected extinguisher is moved from its original position, it emits an ear piercing alarm (drawing immediate attention) for 30 seconds, three minutes, continuous or annunciator mode (as preset by user). The highly visible stop sign design and the words, “STOP, EMERGENCY USE ONLY” also discourages wrongful use. Sound intensity choices include 95 or 105 dB. Three year guarantee against breakage of polycarbonate, one year on electronics. For indoor use only. STI-6400 — Highly effective alarm alerts to any unauthorized exits/entries through emergency exit doors and rear doors. It serves as an inexpensive security device and helps stop theft as well. If the protected door is opened, the unit emits an ear piercing alarm for 30 seconds, three minutes, continuous or annunciator mode (as preset by user). 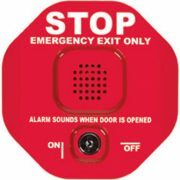 A key operated override will silence the alarm and allow authorized exits. Stopper is fitted with a long life 9 VDC battery. Three year guarantee against breakage of polycarbonate, one year on electronics. For indoor use only. STI-32500 — This musical wireless doorbell chime is easy to install, with no electrical wiring and no expensive through-the-wall drilling. When someone presses the button, it sends a wireless signal to the receiver, alerting someone has arrived. There are thirteen sounds that can be selected with the push of a button on the transmitter. Quickly distinguish between front and back doors by adding more transmitters and programming a different tune on each. Operates up to 250 feet and the receiver has a low, medium and high volume adjustment. ETL Listed, FCC Certified. 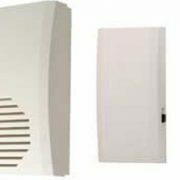 STI-32600 — Wireless chime notifies when a door is opened. The easy to install device greets visitors with the sound of music and alerts to their presence. Simply mount the transmitter and magnet to any door and plug the remote receiver into any electrical outlet. When the monitored door is opened, it sends a signal to the remote receiver, announcing an entrance with one of thirteen selectable sounds. Can also be used as an alarm. Alarm sounds can be selected with a switch located on the transmitter. Operates up to 150 feet, ETL Listed, FCC Certified. 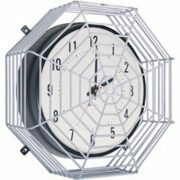 STI-9632 — Wire guard protects a wide range of clocks, bells and similar instruments from vandalism and accidental damage. Wherever these units are at a risk from either intentional or accidental damage, installation of this tough cover is the solution to the problem. Guard is construction of 9-gauge coated steel wire which makes it extremely difficult to break. Backed by a three year guarantee against breakage in normal use. SS-2105X — ADA Compliant, multipurpose push button switch covers a wide range of applications indoors and outdoors. Button incorporates a unique, patented design that helps dramatically to stop accidental activation. Button is often referred to as a “short-switch” because it fits into a standard electrical box. It has Two Form “C” contacts rated at 10 amp @ 125/250 VAC, ½ HP 30 VDC, 6A. The green housing is molded of tough polycarbonate, has an “EXIT” label and a Momentary Mushroom button. Three year guarantee against breakage of polycarbonate, one year on electronics. UL/cUL Listed, ADA Compliant. SS-2401E — ADA Compliant, multipurpose push button switch covers a wide range of applications indoors and outdoors. Button incorporates a unique, patented design that helps dramatically to stop accidental activation. Has an interchangeable or replaceable N.O. or N.C., SPST gold-plated contact blocks rated for 3 amps @ 600 VAC or 1 amp @ 250 VDC. The blue housing is molded of tough polycarbonate, has an “EMERGENCY” label and a Push, Turn-to-Reset button. Three year guarantee against breakage of polycarbonate, one year on electronics. UL/cUL Listed, ADA Compliant.